Hazhir Mahmoodi Nasrabadi received his B.Sc. in Electrical Engineering from the University of Tehran, Tehran, Iran in 2018 and honored to be among top 10% students. 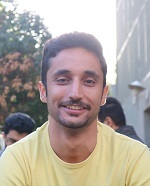 He is currently a Ph.D. student in Electrical Engineering Department at the University of Texas at Dallas and a member of Laboratory for Dynamics and Control of Nanosystems. His research interests are Electronic, Microfabrication, MEMS, Digital Logic Design, and Power Electronic.